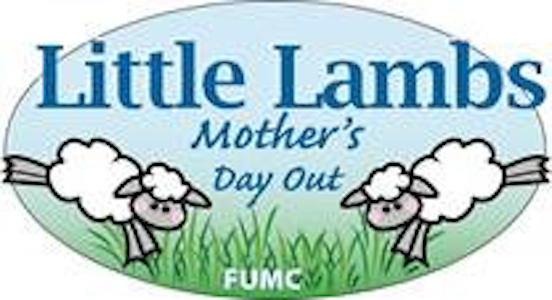 Little Lambs Mother’s Day Out is a Christ centered ministry of Fellowship United Methodist Church. The program allows children, ages 1-year through pre-K, the opportunity to be with other children in a structured and loving environment. Our program was born out of a love of children, and the desire to teach them that Jesus Christ is alive today, and that he loves each one of them. We want to teach children the golden rule, and strive to be an example for them. Another one of our desires for the children, is to make sure they know that they are loved and that their class is a place where they want to be. Our program is available four days per week, with each session two days per week. State Regulations limit each child to one session. We offer two sessions to choose from: Mondays and Wednesdays from 9:00 am – 2:30 pm; or Tuesdays and Thursdays from 9:00 am – 2:30 pm. The cost of the program is $160.00 a month with a $75.00 registration fee. Contact Anne Rowland at mothersdayout@tnfellowship.com or by calling 615-890-6543 to tour the facility and register. Mission Statement | The mission of the Little Lambs Mother’s Day Out program is to provide an environment that will facilitate a solid spiritual and academic foundation in each child. The Philosophy | The philosophy of the Little Lambs Mother’s Day Out is that exposure to an environment based on Biblical principles and teaching, along with strong academic fundamentals will create spiritually grounded and well educated people.